50. In those early morning hours I explained to you that I would offer proofs for certain persons living completely outside the spiritual vibrations and doubting everything because of this, that they could see with their own eyes. 51. So I troubled myself to start the ship visibly before all eyes and to (then) let it disappear. 52. I even tried to fly the ship directly over your waiting friends, among whom was the mentioned person who lacks the spiritual abilities. 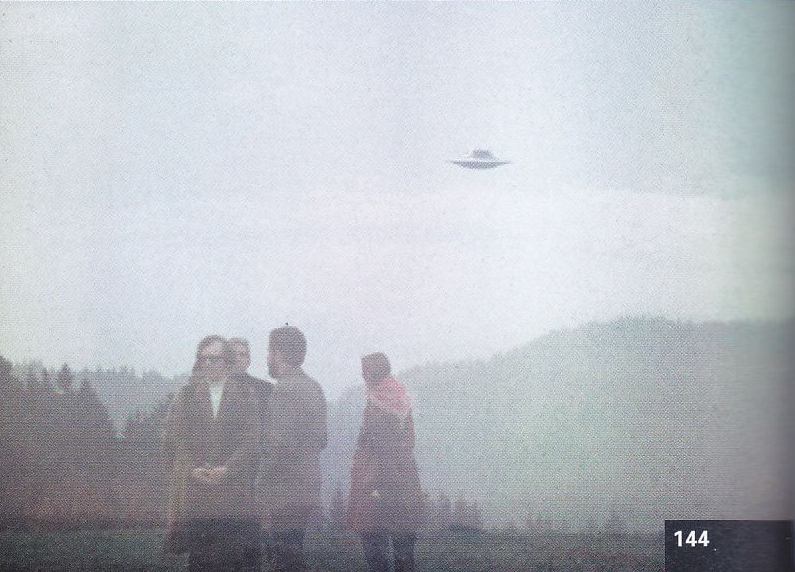 As evidence of his contacts with ETs, Meier produced a total of 11 photos from this episode supposedly photographed behind Jakobsberg-Allenberg in the vicinity of Bäretswil, and whose photo catalogue numbers are #100, #101 and all the ones from #139 to #147. And the names of the 8 members he captured on these images are – Hans Jacob and his two daughters Claudia Jacob and Cornelia Jacob, Mr. Liniger, Mr. Leuenberger, Jakobus Bertschinger and two of Meier’s children – Atlantis and Gilgamesha (according to Methusalem Meier1). All of the following photos, except the last #147, have been scanned from the Photo Inventarium (PI) book published by Billy Meier in 2014. 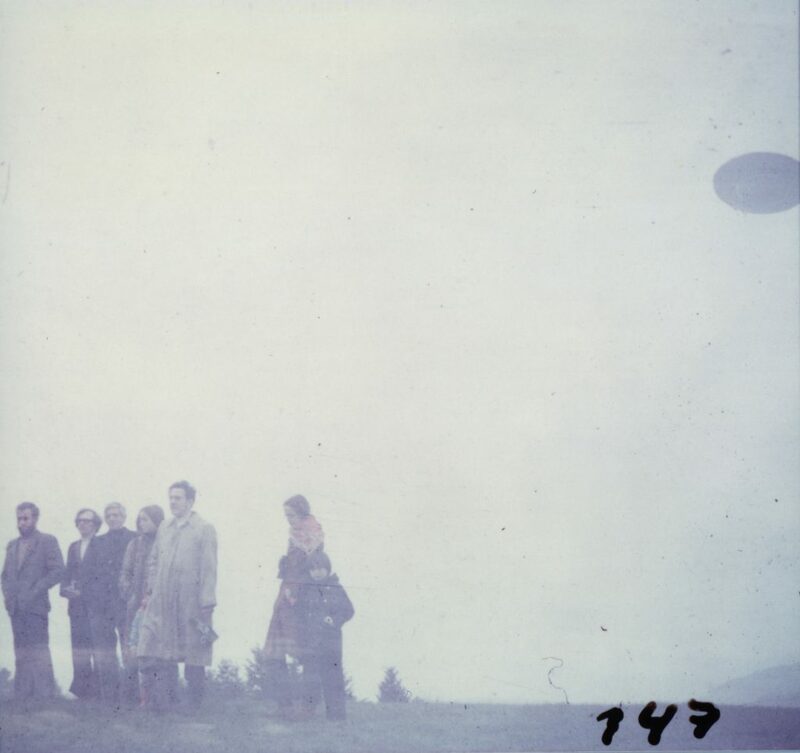 However the photo #147 below, that has been severely cropped in PI, has been taken from the Wendelle Stevens/Joe Fex collection of Meier’s beamship photo album. Compared to the Stevens collection, most of the below photos from PI were cropped at the edges. We are not even sure whether or not the photos in Steven’s collection are in their original form. List of Meier’s photo catalogue numbers along with the times (24 hr. 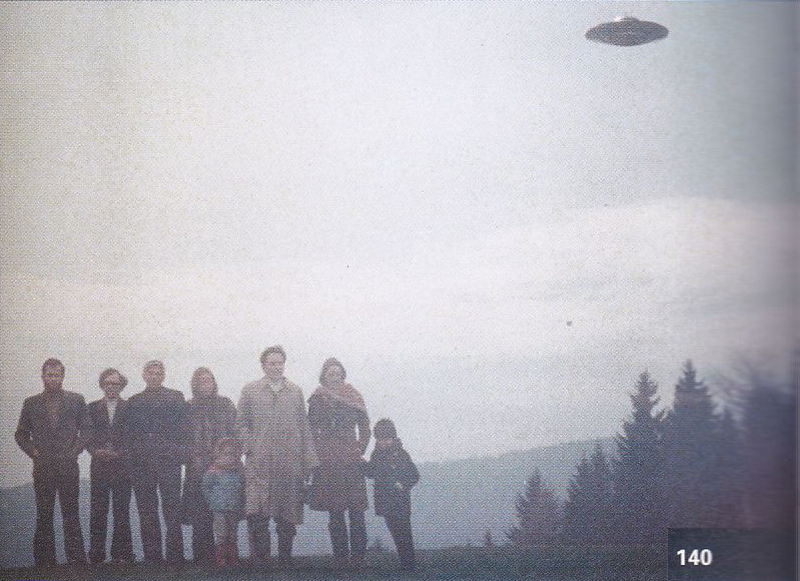 format), the corresponding 11 pictures were supposedly photographed on April 20, 1975. The photo shows two ships, but it is only one ship. The effect was so that Semjase jumped from one location to another during the exposure time of 1/100 sec, so her ship was captured twice during the same exposure time. I remember that Billy invited us to meet Semjase one day. So I went with my father. There was a group of us, and we stood for hours waiting and standing around. We never saw the ship. Nothing happened. And then Billy comes by days later with his film and shows us the pictures and says that Semjase was there above us all the time and that we just did not see her! 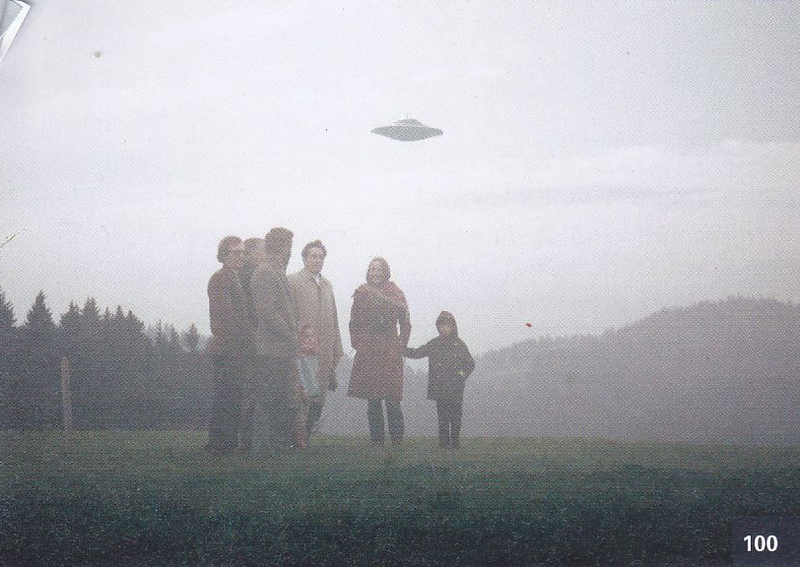 (Laughing) So when this happened, my father was doubting about Billy Meier and what he was telling us. We were standing there. I remember there was no ship. 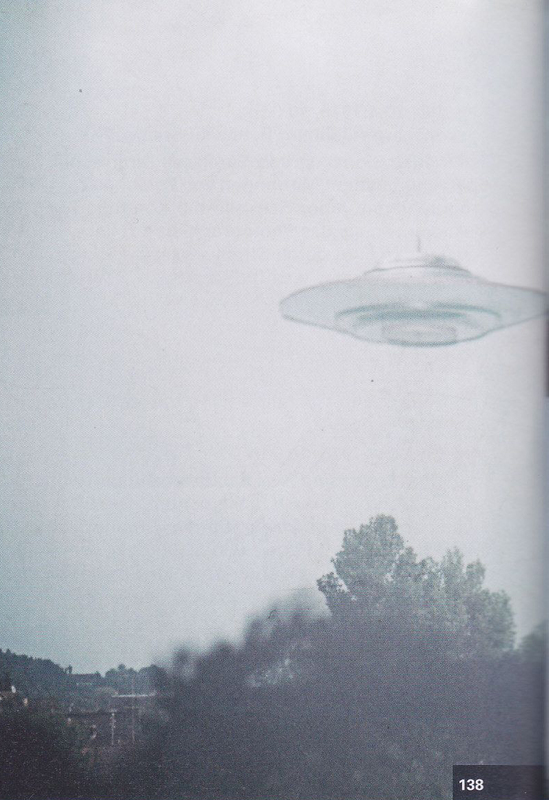 And the most revealing evidence comes from the fact that only in pictures personally taken by Meier on that day do we see the double-exposed background scenery and the alleged “UFO”. 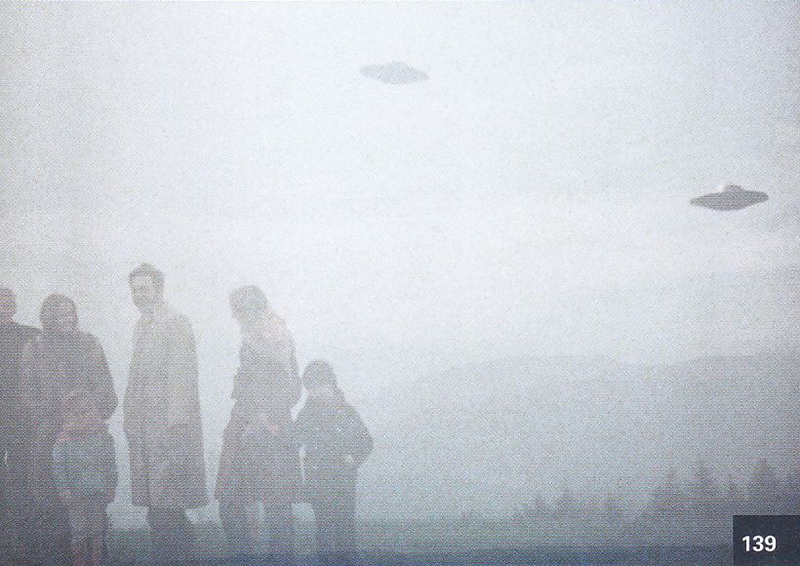 But according to Korff, in all the other pictures on the roll of film not taken by Meier but by Hans Jacob (see below), neither the “UFO” nor the double-exposed background scenery are visible. Following is one such photo. 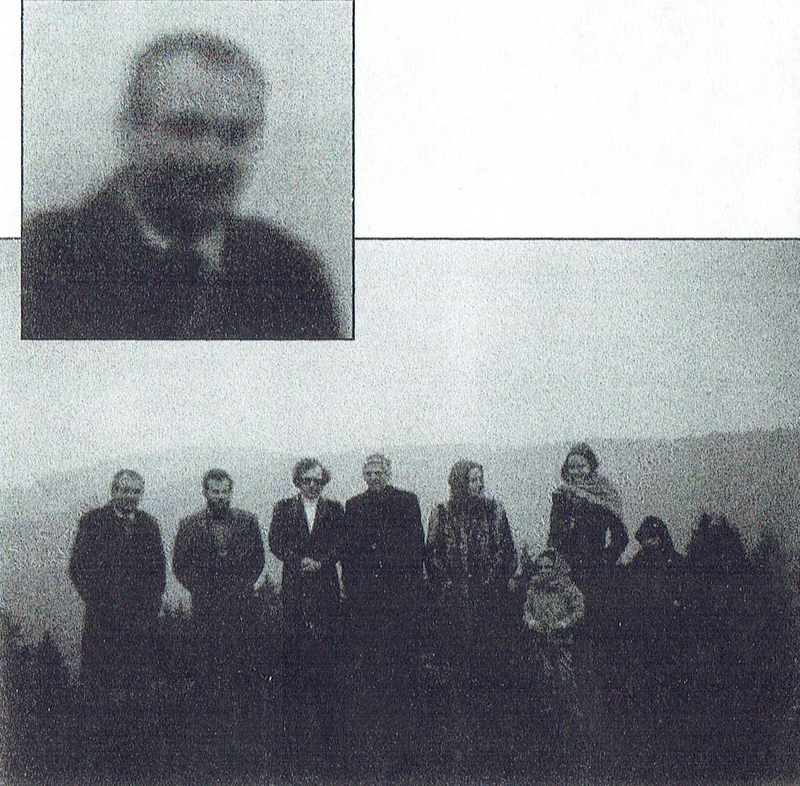 The zoomed face of the person in the inset is Billy Meier, seen on the extreme left in the photo. The most obvious evidence of hoax is the indisputable element of double exposure in almost all photos, most easily discernible in photos #101, #139 and from #141 to #144. One can clearly notice the distant hill and trees in the background passing through the people in the photo. Also, towards the bottom of the photos, what appears like overlapping of different landscapes can be noticed. What did other investigators comment on these photos? When Meier got the developed slides back and had them printed, he was sure that the Pleiadians had posed their ship over the heads of the people, but in a computer we were able to separate the two pictures into their separate parts and they look to be double exposures. If they were double exposures, the film frames matched together quite closely, which seems to be something very difficult to do, if not purely by accident. ..these pictures are clearly double exposures…The two images seen here can be separated in a computer and each picture viewed individually, and then the ship is not seen over the heads of anybody on the frame including the craft. A simple visual examination of Billy Meier’s entire Jakobsberg-Allenberg sequence reveals that they are deliberate, methodical double exposures. The evidence for this exists in how all the ten frames line up with one another in each of the double-exposed images. Such precision by pure coincidence is highly unlikely. Essentially, both Wendelle Stevens and Kal Korff were stating that it is ‘very difficult‘ or ‘highly unlikely‘ to get the two exposures (containing elements such as sky, people, trees and landscape) in each double exposed image align or match together closely as seen in those images taken by Meier. If there was an accidental double exposure, normally the alignment of the images would be likely more off than those seen in Meier’s. Realizing these facts, while Stevens sides with the highly improbable accidental double exposure theory, Korff concludes the most probable which is that Meier deliberately re-used the same film twice so as to make the model beamship from one exposure appear above the heads of people from another exposure. The photo sequence numbering provided by Meier doesn’t fit at all with the information in the photos. Consider photos #100, #101 and #139 which are supposedly taken by Meier between 10:00 AM and 10:01 AM within a span of 1 minute, yet they show people standing in different positions looking in different directions with different backgrounds. Now consider photos #101, #140 and #142, showing people standing in same positions looking in same direction (towards the camera) with the same background, clearly indicating that they must be taken immediately in sequence one after the other (in the case of #101 and #140 it must be a few seconds). Yet we are told they are taken at different times – #101 at 10:00 AM, #140 at 10:01 AM and #142 at 10:03 AM. Also, the clouds in the photos – #101, #140, #141 and #142 – apparently taken in sequence in a short 4 minutes (~1 min. between each photo) span, either appear differently or at different positions in the sky, raising serious suspicion on the authenticity of the photos. Apparently, Meier anticipating the backlash from the above glaring facts seems to have cooked-up a story for his troubled followers. The short story goes like this – Semjase, who first agreed to appear before Meier’s skeptical members of his group in her beamship later got exasperated by the fact that none of them failed to notice not only the presence of her beamship above their heads in the sky but also her telepathic messages transmitted to them. So, she became angry and destroyed the film (at or on the way to lab) by radiation, that however was later developed by Meier into slides which, in a rather “cosmic coincidence”, not only happen to look just like deliberately-made, crude double exposures but also were detected as such through computer analyses. More on this later. Now to the long story. 44. The material intellect of the three persons is very strong and they do not reason and act from spiritual intellect. 45. They believe that they could, but here in this respect they are self-deceiving. 46. Their spirit intellect is underdeveloped. 47. They fancy spiritual intellect being the same as material intellect, for they don’t see the difference. 48. This is dangerous for our mission; in consequence of which I am forced to make myself decide whether a destruction of the film is not demanded. 49. If I really must do this, then I still have enough time to do that before you get the negatives in your hands. 53. As expected, this one doubted by ship as such, although he could see it with his own eyes. 54. I checked his thoughts and found that in that man no recognition flashed. 55. His thoughts were mere doubts. 56. His material intellect was so strong that he did not notice the penetration of my thoughts, while with the others this was evident, even though they did not understand this process. 57. They felt my thoughts invading by a brief cooling of the forehead, which in ignorance of the fact, they took for a breath of wind. 77. You know very well, such persons being unserviceable for our matter in every respect, but nevertheless, you have not closed them out of your group. 78. From that, I see myself forced to exclude all that is disadvantageous. 79. So I order that you are no more allowed to inform the above mentioned persons about matters and events of our contacts. 80. I do not want, and can not prohibit you from contact with them, but order the keeping from them of further important matters and information. 81. If you do not perform accordingly, then I would have to interrupt our contacts and search another contact person. Here, it is quite obvious that it is not the fictional Semjase but Meier himself who under the cover of “Semjase’s threat to terminate the contacts” issued veiled threats to his skeptical followers with expulsion from the group if they dare question his claims or doubt his “ET” contacts. Apparently such threats seemed to have worked because, Hans Jacob, one of those doubters Semjase mentioned above and one whose photographs didn’t show any beamship at all, has fallen in line, stayed back and worked closely with Meier until his departure from FIGU 2 years later in 1977. 12. But their whole mind is not well for our undertaking. So I have wondered whether I should destroy the film which you have exposed on Sunday morning of the 20th, at 10:00, in which they were photographed. 13. In respect to the (possible) harm for our mission, of their kind of thoughts and opinions…I have decided to destroy the film as was advised. 14. Thus I have destroyed that part of the film on which the disturbing factors [BMUFOR note: =doubters] are exposed. Well then – you have destroyed exactly the wrong half of the film, in which all the rest of the pictures were also affected. 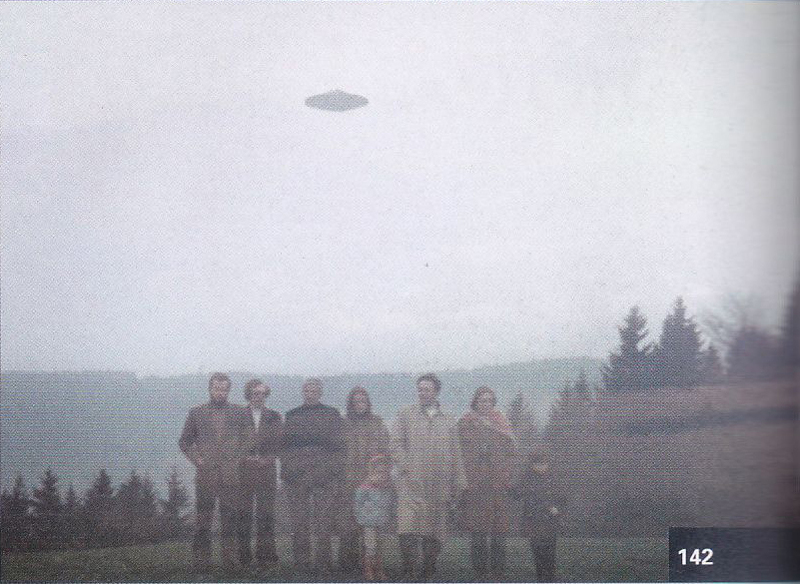 About ten pictures are still visible to use, and on these are all persons, and also your beamship recognizable. They are vague and unclear all right, but one can still recognize all. Here it is obvious that Meier was trying to defend the double-exposed nature of his photos by claiming that those “seemingly-fake” artifacts were just the result of Semjase’s failed attempt at destroying his photos. Information – from Meier’s Contact Reports 12-14 and also from the witness testimonies of Hans Jacob’s daughters documented by Kal Korff – clearly indicate that Meier had invited his group members to a certain location on April 20, 1975, to provide concrete proof by allowing them to witness Semjase’s beamship hovering in the sky with their naked eyes. But in other pro-sources published much later by Wendelle Stevens and Guido Moosbrugger,7 the reason Meier invited his group members was to demonstrate to them the workings of Plejaren’s advanced technology of sector shielding, whereby Plejaren are able to make their ship invisible to undesired onlookers while it was being seen and photographed or filmed only by Meier. So, which one is it? Or can it be both? Whatever it is, the answer is moot because the fact remains that the photos apparently taken on that day were clear double exposures. Nowhere in the Contact Reports and also from the witness testimonies of Hans Jacob’s daughters, did they mention that the film Meier used for photographing on that day was bought by a person other than Meier, who then handed it over to him. Likewise it was also not mentioned that the film was developed by a person other than Meier. However, once again only in the Wendelle Stevens and Guido’s book published much later, it was mentioned as such. Eduard Meier was invited to bring some close friends to a photographic event which the extraterrestrial woman had promised. He was told to have them provide fresh film for his camera which they would load into the camera themselves. Then Semjase would provide a flight demonstration for him to photograph..
One gentleman had procured a Kodak slide film and handed it over to Billy in plain view of all those present. After Billy loaded this film into his camera, he moved a short distance away but still within the view of the group and started photographing the Pleiadian ship. (..) After taking the pictures, Billy gave the exposed film to the aforementioned Mr. H.J. who then sent it to the Kodak Company for development and was the first to receive the developed pictures before passing them on to Billy. These later statements are very suspicious because if Meier was subjected to such intense scrutiny, allegedly suggested by Semjase, on that day, it would have been mentioned in the contact notes or at least discussed by Meier in his own writings at that time. But the lack of such, strongly forces us to reject this account that must have been spun only years later. Mr. Liniger personally got a slide-film, which he put into the camera of Billy, after which he took the camera itself and handed over to Billy at the shooting location so that he could make the recordings. After photographing, Mr. Liniger took the camera back and removed the exposed film, which he personally brought to the photographer. It was only a few days later that Billy received the developed slides from Mr. Liniger. Billy had no influence on the film and the slides. Even we give Meier the benefit of doubt and accept the above tale, the absence of any personal testimony (checked Zeugenbuch from 2001 and other sources) by Mr. Liniger causes us to doubt this story because Meier has been very prudent since the beginning with documenting personal testimonies of his followers who in their minds supposedly witnessed or experienced beamship sightings, ET sightings, paranormal events or assassination attempts. This leads us to believe that either the events surrounding the film purchase, loading into Meier’s camera and later development by Mr. Liniger, mentioned only later, never happened or didn’t happen systematically and scientifically under controlled conditions. Or simply that Mr. Liniger was an accomplice to Meier’s deception. 60. So please, for this reason, do not be disappointed if I should destroy the film. 61. But I would concede later a chance for you again making new pictures, where only those persons suited for our mission would be allowed in the pictures. 15. Your close friends should not be disappointed for that, as in the day tomorrow, I want to give you one more chance, during the afternoon, to photograph further pictures. 16. I have but to settle on the destination, no disturbing factors there being allowed, such as the mentioned persons present. Despite this promise of new pictures by Semjase, no such pictures were ever taken. Why? Perhaps Meier might have anticipated too much criticism and objection even among his followers from the upcoming new pictures, which once again would be undoubtedly classified as double exposures. Even though Wendelle Stevens acknowledges that the given photos were clearly double exposures, he put forths his own idea that is quite different and antithetical to Meier’s on how such double exposures came about. Stevens, basically claims that the film on which Meier actually photographed some witnesses without the Semjase’s beamship on April 20 at 10:00 AM was again accidentally reused for another event where her beamship was photographed – giving the obvious effect double exposure. This later event, Stevens points to two different times in his two different publications. On pg. 179 of his Message from the Pleiades, Vol. 1 published in 1988, he cites April 26 (1975) but on pg. 89 of his UFO Contact from the Pleiades: A Supplementary Investigation Report (SIR) published in 1989, he cites 2:40 PM on the same day April 20 (1975). Of course, Meier outright contradicts this explanation and insists that he actually photographed Semjase’s beamship on April 20. One other main contradiction to Steven’s explanation is that there was no record of any photos or videos ever having been shot either on April 20 at 2:30 PM or on April 26. If Meier accidentally used the same one roll of film for two photographic events, as Stevens suggested, one can easily verify this by looking at the film on which there would be double exposure shots in the beginning and only-beamship shots in the latter part of the film.9 But, on pg. 88 of his SIR, Stevens states that since all the original diapositives have been lost, he was unable to locate those originals for possible verification.10 How convenient! …For certain reasons, I didn’t want the group of spectators to be included in the photographs, but I still allowed the ship to be visible to you and on the film, which I then later tried to destroy and committed another mistake in doing so. In my incomprehensible state of excitement, I furthermore projected the landscape picture, which I happened to see from my ship at that moment in front of your camera. (..) Consequently, there must actually be two different pictures to see on your negatives or slides that flow into one another (double exposures), at least in several of the pictures. I furthermore emitted a bundled light source simultaneously with the projection to overexpose your film, in which I did not succeed, either. 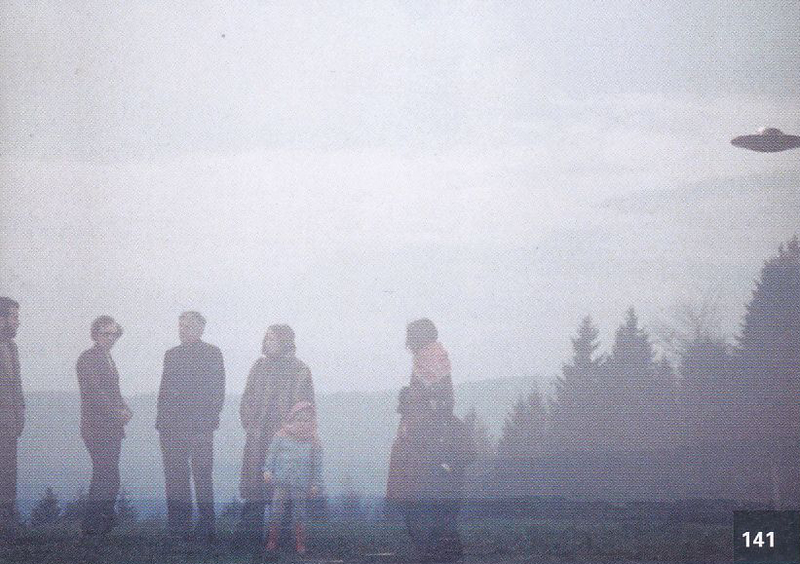 For some incomprehensible reason, the light source only produced the effect of a double exposure, which did not destroy the pictures but only damaged their sharpness. And lastly, I wanted to do even more and emitted an eliminator shortly before the film was developed in order to destroy the film. In my state of excitement though, which I simply cannot understand, I programmed it in the exact opposite sequence, which destroyed the wrong half of the film. This information from Contact Report 32, once again contradicts the information from Contact Reports 12, 13 and 14. In Contact Report 32, it was stated by Semjase that due to her “incomprehensible state of excitement” at that time around 10:00 AM on April 20 tried to destroy the film by projecting the landscape that was in front of Meier’s camera and at the same time also emitted a bundled light source – both of which “accidentally” created the double exposure effect (how convenient!!!). This contradicts with the information from the earlier reports where it was mentioned that Semjase only destroyed them after warning Meier two times on April 20 and 21 and also after much deliberation, somewhere on or between April 22 and 25. Nowhere in the earlier reports were there any statements about Semjase feeling or acting incomprehensibly, or trying to destroy the film by landscape projection or light emission or by eliminator (whatever that means!). Semjase, during the 15th contact on May 1 (1975), explains to Meier that among every 1000 claims made by people in general on experiencing the so-called astral travels, only 2 or 3 are actually real. She claims that while the majority arise from lies and deceit, the rest arise due to self-suggestion and the misrepresentation of pictorial visions and spirit-image projections. This last phenomenon of spirit-image projection, Semjase explains, is the process by which a person can project his/her image spiritually to another place or time. She then proposes an experiment in which using the technique of spirit-image projection, she will project 3 of Meier’s friends (Leuenberger, Jakobus Bertschinger and Hans Jacob) from the past photo session (April 20, 1975) into the present for photographing along with her beamship. 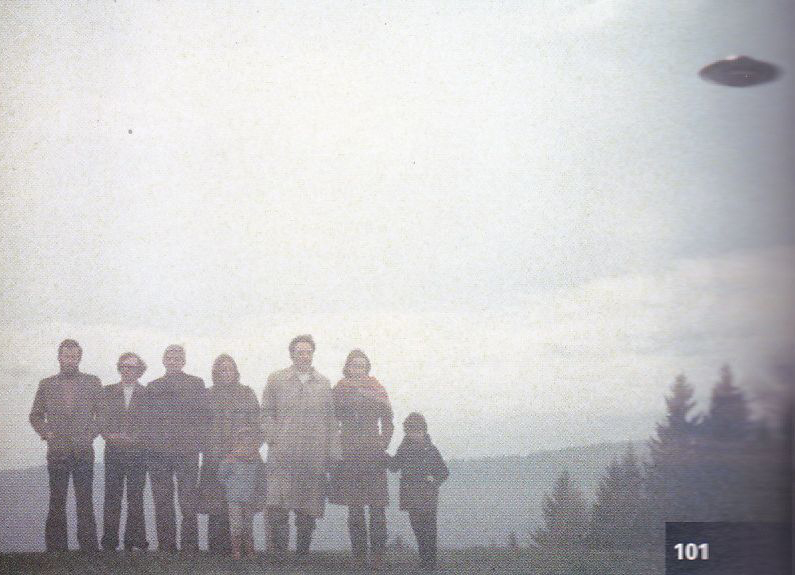 Meier published below photo #114 – supposedly taken at 4 PM on June 14, 1975 at Fuchsbüel-Hofhalden/Ob. Balm-Wetzikon – as evidence of Semjase’s spirit-image projection technique. Test-projection photo. With the help of Semjase, three people who were present at the shooting place were projected into the film, although they were standing sideways behind the camera: Mr. Jakob, Hr. Bertschinger and Hr. Leuenberger. The film was exposed by Mr. Liniger. 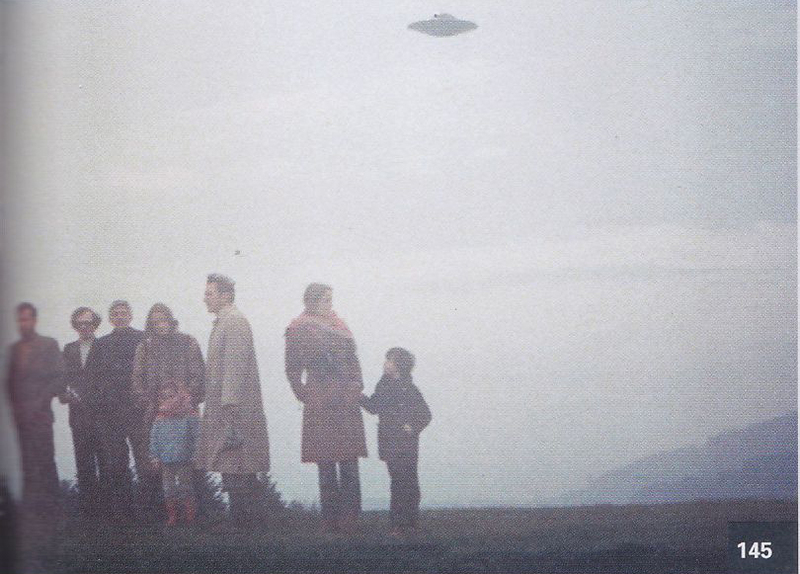 One can see the faint human forms towards the bottom right of the photo apparently (compare clothes) belonging to the above listed three persons from the April 20 event, and also the beamship at the top. 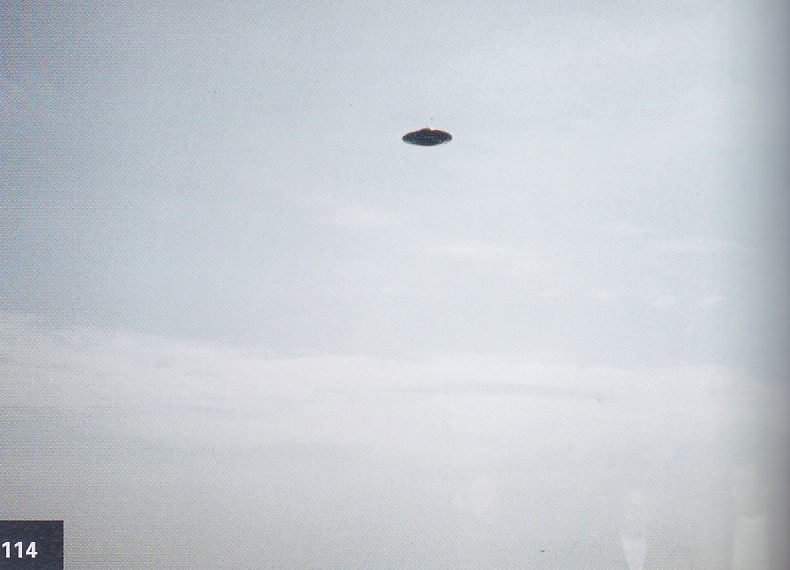 We are told that this #114 was photographed by the person Franz Liniger of an empty sky on June 14, and when the film was later developed – most certainly under the exclusive control of Meier – magically shows a beamship and the three persons. This image of the three persons, which allegedly was not even photographed by Meier on April 20 since they were just standing behind the camera, was projected into the present (June 14) from the past (April 20) by Semjase using the spirit-image projection technique. We have only Meier’s word for it, while there is every reason to believe the possibility that those three persons may very well have been photographed by Meier himself on that day. Why do all photos of Meier that are supposed to show both the people and the beamship in one image, distinctively resemble double exposures and not like any other ordinary photograph with people and things in it? The answer is simple, and it is because they actually are deliberately made crude double exposures. 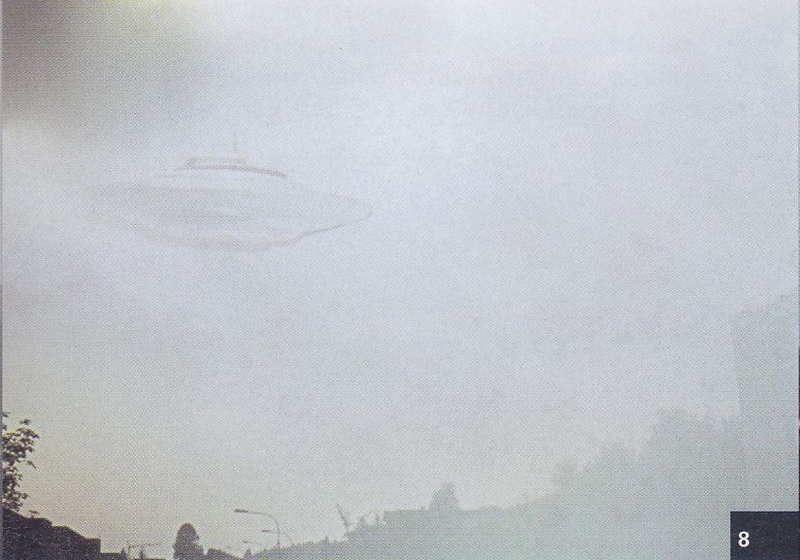 On May 20, 1975, Meier allegedly captured two photos of Semjase’s beamship at 3:00 PM (#138) and 3:05 PM (#8) at the location of Wihaldenstrasse 10, Hinwil. Beamship of Semjase over the Wihaldenstrasse in the north in Hinwil. The ship is semi-transparent. The proximity of the vessel and its vibrations may have affected the quality of the film. But the thick, dark contours of the beamship in both images strongly suggests a simple cut-and-paste trickery was employed, where the shape of the beamship(s) was first cut out from the print and then was placed on another print with background scene, which were then photographed together. 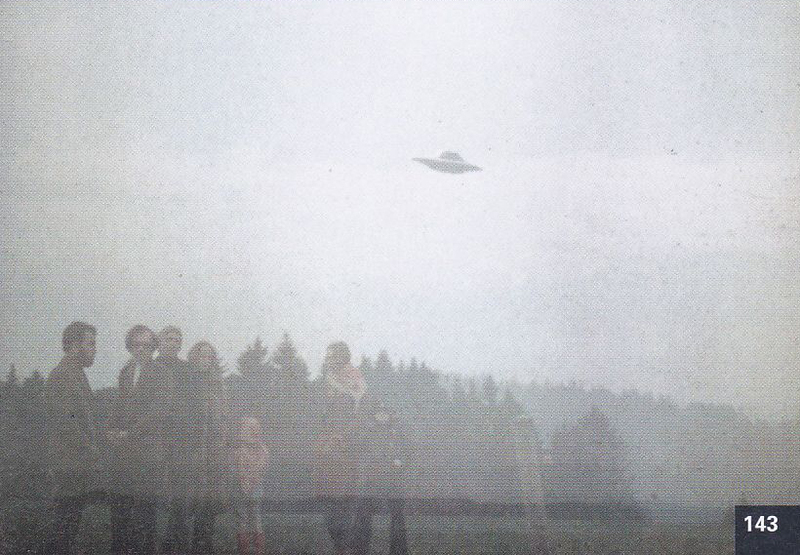 From the above investigation, it is quite clear that most, if not all, of the 11 photos – supposedly photographed by Meier behind Jakobsberg-Allenberg in the vicinity of Bäretswil on April 20, 1975 – are deliberately made crude double exposures. Either, Meier may have shot photographs of people on April 20 on a film that was already exposed with a beamship model taken at the same location earlier, or he may have photographed those people on a new film and later had them superimposed onto the beamship film in dark room. 17. Eventuelle uneingeweihte mitbelichtete Personen stören weiter jedoch nicht, jedoch aber Eingeweihte, wenn sie der Sache undienlich entgegenstehen. 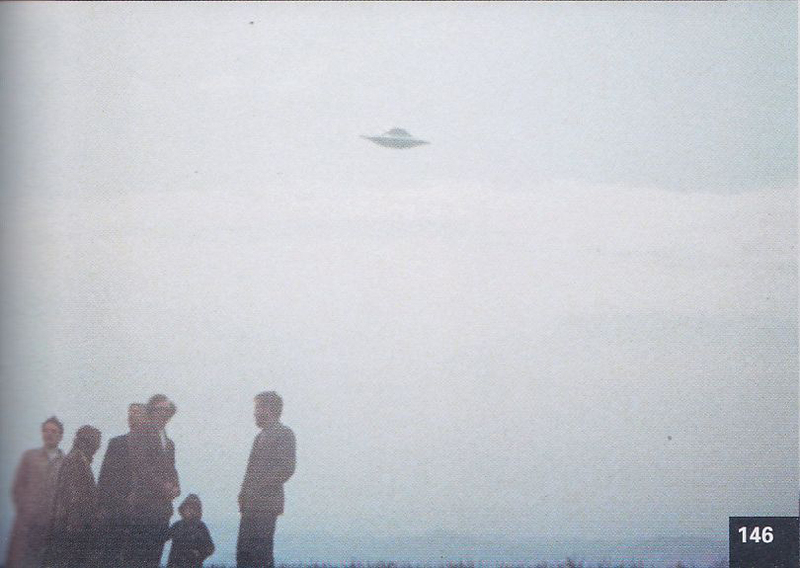 All UFO photographs, films, video, audio, and Contact Reports: © "Billy" Eduard Albert Meier/FIGU. Mahesh Karumudi reserves the rights to all materials on this site not copyrighted by others, and they may not be used without permission. And any material not created by Mahesh Karumudi on this website is used with permission of the copyright holder or is presented here under the "Fair Use" provisions of Section 107 of the US Copyright Act (Title 17, U.S. Code). For more information on Fair Use of copyrighted materials please click here and here. Billy Meier UFO Research ©2014-2019.